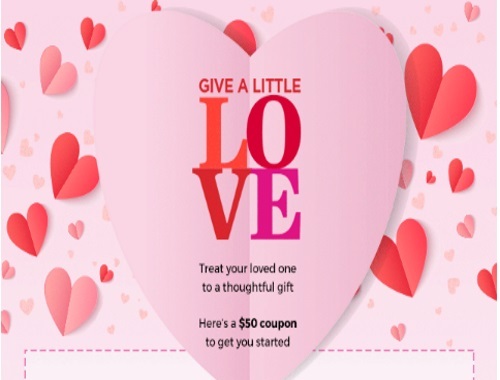 Give a little love and treat your loved one to a thoughtful gift from Sears! Save up to $50 off your order with the promo code below! Save $20 off when you spend $100 or more, with the promo code LOVE20 at checkout. Save $50 off when you spend $200 or more, with the promo code LOVE50 at checkout. Excludes items with prices ending in .94, .91, .88 and .97, Clearance, Flash Sales, and Canada's Best items. Also excludes Major Appliances, Cosmetics, Fragrances & Grooming, Patio Furniture/Decor & BBQs, Outdoor Power Equipment, Garage Door Openers, Gladiator, Panasonic, Magic Bullet, SodaStream, Nespresso, Keurig, Diono, Nuna, Medela, KidCo, HALO Bassinets, Dyson, iRobot, Miele, Rug Doctor, Miz Mooz, Pajar, Santana Canada, Report Collection, Gift Card purchases, deferral or installment billing fees, protection agreements, delivery, installation and maintenance charges. Offer is valid February 9-12, 2017. Click here to browse Sears.